The eGov magazine enjoys the distinction of being Asia’s first magazine on e-Governance. Founded in 2005, the monthly magazine is published in both print and online formats, and is focussed exclusively on promoting innovations to bring efficiency, accountability and transparency to various citizens and business related initiatives of the government. No other magazine in Asia offers readers such in-depth coverage of new e-Governance models. We cover all aspects of e-Governance – from new technological advances in ICT to the ways in which common citizens benefit when their interactions with government departments are through digital interfaces and the myriad issues involved in implementation of e-Governance initiatives. The eGov magazine’s biggest advantage is its ability to carry the views of all the stakeholders in e-Governance domain – policy makers, experts, industry leaders, administrators and the academia. Our experienced team of editors, researchers, and marketers take a 360-degree approach for creating content – breaking news, feature articles and interviews – that can keep our steadily growing global audience well informed on issues of e-Governance. The who’s who in the industry disseminate their ideas and innovations through the pages of our magazine. eGov aims to be your first stop for what’s new and what’s next in e-Governance. About Elets Technomedia Pvt. Ltd.
Elets Technomedia Pvt. Ltd. is the publisher of eGov magazine. The company also publishes two other popular monthly magazines – digitalLEARNING and eHEALTH. All three magazines are available in print and digital version and are known for their in-depth coverage of ICT technologies, insightful commentary on stakeholders involved, and interesting perspectives on the ways by which newer tools from ICT are bringing seminal improvements in people’s lives. A premier media and events management company, established in year 2003, Elets Technomedia Pvt. Ltd. is also engaged in organising events and conferences in different locations in Asia. Leading thinkers, politicians, policy makers, academics, authors, experts, industry leaders and administrators grace the events and conferences organised by Elets Technomedia Pvt. Ltd. and contribute their thoughts and ideas for the general benefit of society. Founder Publisher, CEO and Editor-in-Chief, Elets Technomedia Pvt. Ltd.
Dr Ravi Gupta, a social entrepreneur, has been promoting innovations in various sectors for the development of society for two decades through research, advocacy, conferences, publications, and workshops in several countries including India, UK, USA, Tunisia, Geneva, Dubai, and Bahrain, Bangladesh, Sri Lanka, Malaysia, and Thailand among others. He is a Ph.D in Business Economics, from University of Delhi, and holds M. Tech from prestigious institution of Indian Institute of Technology (IIT) Roorkee, India, where he studied Applied Geophysics. He did another M. Tech from Indian Institute of Technology (IIT) Kanpur, India, studying Remote Sensing & Geographic Information System (GIS). Dr Gupta’s illustrious professional career encompasses various shades of rich experiences. In 1997, he co-founded the Centre for Science Development and Media Studies (CSDMS) in 1997, and the Geospatial Media & Communications in 1999. Dr Gupta was co-founder and Editor-in-Chief of the monthly magazine on geospatial technologies “GIS Development” from 1998 to 2008. He has been a Member of the Task Force on ‘National Spatial Data Infrastructure’ in 2001-03, by Department of Science and Technology, Government of India. In Netherlands, he worked as a Member of Research on National Geographic Information Policy Initiatives of several developed and developing countries in 2003. In 2009, Dr Gupta received “Community Builder of the Year” Award, given by UN Solution Exchange India. He worked as member of UN GAID Strategy Council for two years (from 2009-2011 FY). During 2010-11, he worked as an Executive Director at “Global Knowledge Partnership Secretariat (GKPS)”. He was also the Co-Chairman of the Education Committee at Ph.D Chambers of Commerce (2011-12). He has also been a member of the “Expert Group on Digital Economy Strategy for the Arab World”, which is led by Arab Federation for Digital Economy, League of Arab States. 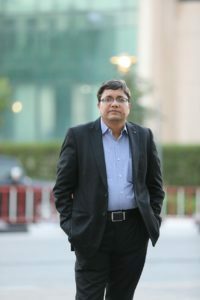 Presently, Dr Gupta is the Founder Publisher, CEO, and Editor-in-Chief of Elets Techonmedia Pvt. Ltd., a media research and innovations advocacy organisation that he co-founded in 2003. The company, since 2004, has been publishing premier monthly print magazines such as “eGOV”, “digitalLEARNING”, and “eHEALTH”. In 2015, another magazine “The Banking and Finance Post” was to the list. Today, these publications focus upon a variety of themes such as tourism, environment, housing, power, transport, waste management, digital learning, start-up, smart city, urban development, green building, Secure IT and Public Sector Undertakings (PSUs).